Typical Karoo dinners are served at the Victoria manor, specialties include Karoo lamb, boboties, chicken pies etc. Die Tuishuise is an elegant collection of beautifully restored Victorian era crafts-men’s houses in Cradock, the frontier town at the eastern edge of the Great Karoo. More than two dozen Tuishuise line Market Street up to the Victoria Manor, a grand old colonial hotel that welcomes you with hearty country fare, décor from the days of Cecil John Rhodes, Olive Schreiner and the droves of adventurers who passed here en route to the hinterland. Modern day overlanders crossing South Africa on holiday and business groups looking for inspiration stay at Die Tuishuise, where they are received like old friends and treated like gentry. Cradock is a place of literary legends, war heroes and anti-Apartheid struggle icons. But it is perhaps best known for street level, day-to-day, warmth and kindness – so typical of much of the Eastern Cape. Character: Each house is decorated in its own distinctive theme of period prints and antique furniture, to reflect an atmosphere of understated elegance, reminiscent of the lifestyles of the English and Dutch Settlers at the turn of the century. Historical & Cultural: Die Tuishuise, built between 1840-1880, have been awarded the coveted “Simon van der Stel” Gold Medal for restoration. Each house is decorated in its own distinctive theme, reminiscent of the lifestyles of the English and Dutch Settlers. Honeymoon Romance: Beautiful, romantic Victorian bedrooms and houses, with lots of privacy, make it a very romantic stay. We also suggest that in winter you request a house with a fireplace. Wedding Venues: Experience everything that is beautiful, unique and special about the Karoo. Let us take care of you and your guests’ accommodation, entertainment and gastronomic needs. Enjoy the attention to detail and personalised service of bygone days. 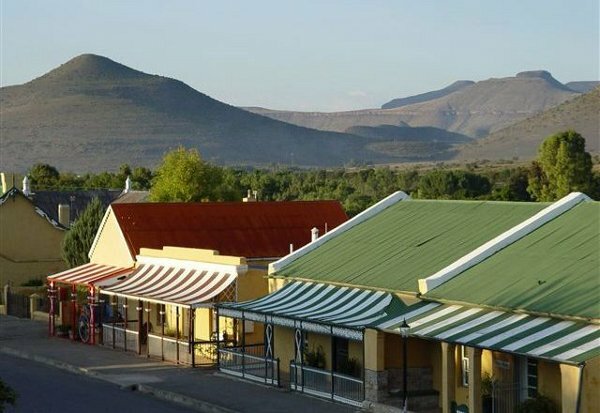 Business Traveller: We are perfectly situated in Cradock, with in walking distance (a block) from the main business district. Business Travellers can enjoy ASDL and WiFi access. The houses provide plenty of space to do last minute or late night work. Conference venue: We can seat up to 100 guests in classroom style. Conference delegates are accommodated on the premises. We are great at catering for special requests and themed events. Pet Friendly: All pets are welcome, please tell us in advance if you are bringing your pets so that we can put you in the ideal house and garden for them. Outstanding Views: From the stoep of Lion House, House 50, Out of Africa, 46 and 42 you can enjoy beautiful views of the Karoo mountains and sunsets. Relaxation: While there is a lot to do in Cradock, it is also the perfect place to just read, walk, sit by the fire and restore your soul. Click here to enquire at Die Tuishuise.